Who Can Help Paint Your Playground? Here at No Fault Sport Group, we get asked a lot who can paint safety surfaces and equipment when it’s time for a playground renovation. 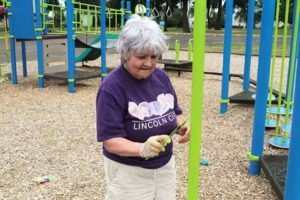 Most community playgrounds (whether at a park, school or church) are on tight budgets, so buying supplies and hiring someone to do the playground work isn’t always a realistic option. But there is good news. 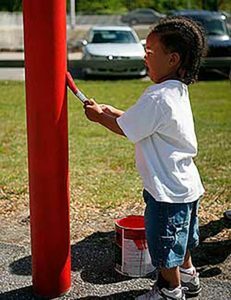 If your playground serves your community, chances are there is a service organization willing to help you paint and perform other needed maintenance and renovations. In fact, here are a few service organizations that might be willing to help you paint your playgrounds. The Association of Junior Leagues International, Inc. (AJLI) is an organization of women promoting voluntarism and improving communities through educational and charitable activities. Since its founding in 1901 by social activist Mary Harriman, The Junior League has evolved into one of the oldest, largest and most effective women’s volunteer organizations in the world, with 150,000 members in 291 Leagues in four countries. The Junior League of Baton Rouge is a great example. Their Painted Playground project focuses on playground revitalization and includes painting and purchasing new equipment to promote physical exercise and outdoor play. Click here to find the Junior League nearest you. You may have heard the saying, “A burden heavy to one is borne lightly by many.” This philosophy is at the core of the Moose organization. Moose is an international organization dedicated to bringing communities closer together and celebrating life. Every year, the Moose organization contributes up to $100 million worth of monetary donations, volunteer hours worked, and miles driven. With a combined membership of over 1,000,000 members in the Loyal Order of Moose and Women of the Moose, their presence is felt in over 1,500 communities. Founded in 1922, National AMBUCS, Inc. is a charitable service organization dedicated to creating mobility and independence for people with disabilities. The organization awards scholarships to therapists and donates AmTryke therapeutic tricycles, which have hand and foot operations for those with disabilities. 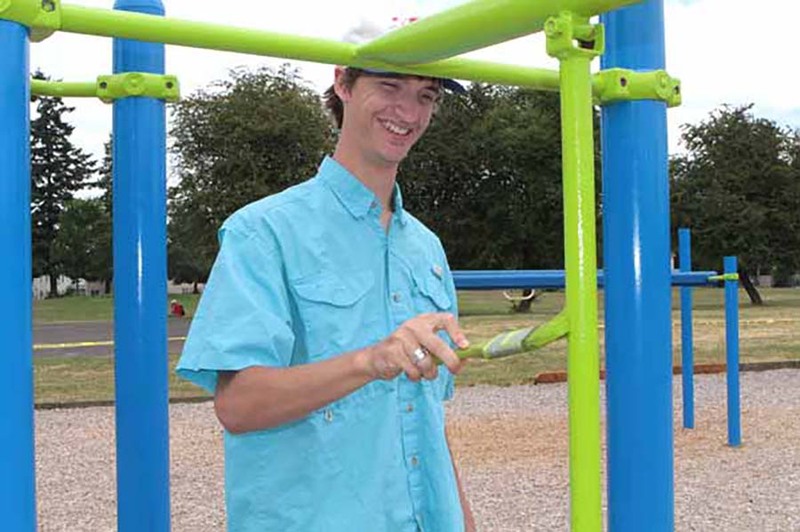 In Amarillo, Texas, the AMBUCS Southwest Chapter donated $394,900 toward building an accessible playground with swings and a zip line specially made for children in wheelchairs. It was Amarillo’s first playground with equipment accessible to children with disabilities. Click here to Find an AMBUCS chapter near you. Founded in 1911, The National Exchange Club is a service organization serving communities through more than 650 local-level clubs. These chapters use their time and talents to benefit their communities through projects in Americanism, Community Service, Youth Programs, and the organization’s National Project, the prevention of child abuse. Members strive to inspire communities to become better places to live. Click here to see if there is a club near you. Optimist Clubs around the world are dedicated to “Bringing Out the Best in Kids.” Adult volunteers join Optimist Clubs to conduct positive service projects in their communities aimed at providing a helping hand to youth. With their upbeat attitude, Optimist Club members help empower young people to be the best that they can be. For example, in Stephenville, Texas, playground equipment at parks and schools bears the name and logo of the local Optimist Club. Since being chartered in 1966, the chapter has raised more than $1,000,000 for youth projects. All donations stay in the community and are used to fund projects that range from uniforms for t-ball teams to afterschool programs to scout houses and playground equipment. Click here to find an Optimist Club near you. Civitan International, founded in 1917 and based in Birmingham, Alabama, serves individual and community needs with an emphasis on developmental disabilities. Civitan has member clubs in 37 countries, all working through direct financial support and hands-on projects to assist people affected by developmental disabilities. Since 1915, Kiwanis clubs, located in 75 nations, keep service at the heart of every project. Members plan 150,000 projects and raise nearly $107 million every year for communities, families and projects. Founded in 1917, Lions Club International are men and women who volunteer their time to humanitarian causes making their community better. As the world’s largest service organization (with 1.35 million members worldwide), Lions are best known for their vision programs, including the world’s largest blindness prevention program. Lions also volunteer for many dif­ferent kinds of community projects such as caring for the environment, feeding the hungry and aiding seniors and the disabled. If you’re lucky enough to enlist a local service organization to help paint your playground, you’ll need to make sure they have the right materials. Questions we hear a lot include: Can the poured-in-place rubber (PIP) be painted? What about tiles and mulch? Is there a certain kind of paint to buy? No Fault Safety Surface (poured-in-place rubber) and No Fault Safety Tile can be painted; the mulch can’t. However, our No Fault Rubber Mulch comes in a variety of colors (black, dark brown, green or terra cotta), and our colors are resistant to fading even after many years of use. Remember, a good semi-gloss acrylic coating made for industrial and marine applications should do the trick. Or you could use an industrial latex paint (the same kind used to stripe tracks.) Our playground material is EPDM rubber, which is the same rubber that’s used on running tracks — it just has larger granules. Finally, if you’re not sure about how to care for or paint your playground equipment (including No Fault products) just contact us at 1-800-NFSPORT (637-7678, and we’ll be happy to help!